I rarely post deals on here, because I amass the better part of my bento collection through little online or local shops, not to mention a few generous friends who live near cool stores. However, this is too good a deal to miss! I don't have a Goodbyn (yet) but I want one! If you join Gilt (a group buy site) through the MTV link, you receive a $20 account credit. It does take a few minutes after registering to have the credit appear in your account. Once you have the credit, hop over to the "Children" tab and check out the awesome selection of Goodbyns for $15 each (not a bad deal anyhow, btw). Add one to your cart, go to checkout. Shipping is just under $8, which means, with your credit, your grand total is about $3 for a Goodbyn! And yes, I ordered one. ;o) Ben chose green, although he actually wanted one with cookies in it, even though I had to tell him they don't come with cookies. In case you are curious, I do not receive referral fees, credits, etc, for this link. Just wanted to share the deal. If you've been thinking about starting to bento, you cannot beat this for a pretty cool box! THANK YOU!!! I thought my $13 Goodbyn on Amazon was a great deal, but this is fantastic! I'm posting a link back to you on my blog for this amazing deal. Same here. I need more boxes like I need a hole in my head (already have several of those too), but for $3? Going to have a friend order a second one for Faith, even for $6, I'll still be good with it! Thanks! I'm excited to give it a try. I ordered the purple one. I wonder why it has such a long delivery date...It said I won't get mine until between Christmas and New Years! But, for $3, I'm not complaining! Ooh thanks! This is an great deal. Thanks! I ordered one and my mom ordered one so I can have one for each of my kiddos! My daughter will start preschool next August, so this is a REALLY early purchase, but I think she'll like it, and it'll be different from her brother's EasyLunchBox, to help her like it even more. Sure hope it works as well as those. Oh goodness! Thank you SO much Shannon!!!! thanks shannon, i wasnt sure if i should get one of these but its definitely work $3. Going to order one!! Ordered mine! Can't wait until January to get it. Wow, thanks!! I just ordered one, $2.95 in total! wow!! I'm heading there now. I've been eyeing them up for some time now. Thanks for sharing this. I ORDERED THREE AND SHARED THE LINK ON FACEBOOK! THANK YOU SO MUCH THIS IS A GREAT CHRISTMAS GIFT AND I HAVE 3 DIFFERENT EMAILS! I can't get link to work. Anyone else having trouble? Thanks for sharing, but I still don't have the $20 credit in my account? Thanks Shannon for the great link. Wow, awesome! I'll give it a shot! Got one, thank you so much! I have this box, it is HUGE!!! 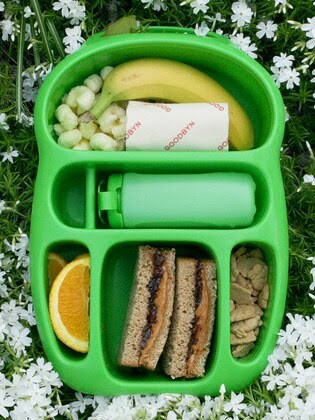 honestly way to big for a kid...so deep it is hard to do cute bento things with it, it would all fall over.. Thank you for posting this deal! I can't wait to receive my Goodbyn. I hope you don't mind, but I included a link to this page on my blog today. I'm like Christina--I was able to get in, but I don't have a credit in my account. Does it show up at the end? Thanks! I got one!! I love adding to my bento collection! Thanks for sharing!! I went through your link and registered last night and still don't have the credit this morning?! How long did you wait for yours?? I'm with the other 2 - got it in my cart after signing up but there's no $20 credit :( is there something we need to do to get that? $3 is really worth it! My first credit came within 10 minutes (several days ago). My husband signed up for one as well and his took several hours, while one of my friends said it seemed close to a full day. Also, I was just wondering if you could put up something for size reference for at least one of your Bentos. Just to understand. thanks! Thank you and i blogged about this post and linked it back to your blog. im a follower too. and even though i dont have the credits yet, i hope they add it soon lol. i know with the holiday season lots of places get backlogged for shipping, which maybe why some are experiencing the long wait for shipping? i just want on to try it out lol and at $3 you cant get better than that. Overall it's 13 x 8.5 x 3" so about 2 inches longer and same width as a standard piece of paper. Thank you for contacting Gilt Groupe. We appreciate hearing from you and are happy to assist you with your inquiry. Welcome to Gilt Groupe! We’re excited to see you’ve joined our site, and congratulate you for your newfound access to our exclusive designer sales! We completely understand the confusion over our promotion with MTV, wherein we provide newly registered members with a $20.00 Credit toward a purchase on Gilt Groupe if they register through MTV. Unfortunately, it appears that some bloggers have misunderstood the offer, and in writing about it have mistakenly presented their own personal referral links on their sites. These links do not activate our MTV sign-up offer, and members who have registered through them will not receive the $20.00 promotional credit. We have since contacted these bloggers and they have agreed to update their links. We sincerely regret this incident and assure you that we did not intended to mislead prospective members in any way, but we are unable to offer this automatically issued credit for any account registered outside the promotion. Thank you for your understanding, and happy shopping! If we can be of further assistance, please do not hesitate to contact Gilt Groupe Customer Support by replying to this e-mail. Thank you. I got one of these and am not a fan. I agree with Danielle above, it is way to big for a child and the weird bin sizes don't really work for my use. I gave away the bins but kept the juice bottles as those work great. I just got mine today. Mine doesn't even close. And yes it is too large for a child. Glad I didn't spend too much $. Not sure if I'll go through the process to return it, but am disappointed.